A lucky pedestrian narrowly avoids being crushed by falling bricks as he strolls past a collapsing building in shocking footage. The clip, filmed on CCTV, shows a man wandering along the busy pavement on Stoke Newington High Street in Hackney, east London on Sunday. But just seconds after he walks past a cafe, a mass of bricks and rubble crash to the ground in a cloud of dust. 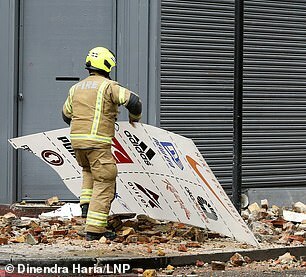 The fortunate pedestrian narrowly misses being crushed by the collapsing building which was ripped apart by high winds. London Fire Brigade said no one was hurt but the clean up of the rubble took almost two hours, the BBC reports. 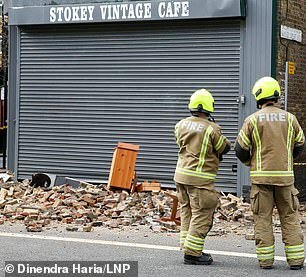 Pictures show a huge pile of fallen bricks and debris littering the street as fire crew tackle the mess. The road had to be closed between between Kingsland High Street at junction with Dalston Lane as the building was deemed unsafe. It comes as high winds wreaked havoc across Britain as roofs and roads were closed due to damage from extreme weather. In London two women had a narrow escape when a scaffolding tower collapsed. 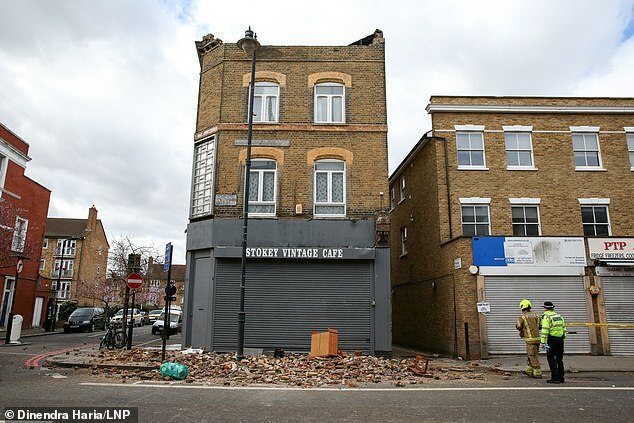 Nicole Brown, 24, and Layla Galvin, 34, avoided death by ‘seconds’ when the structure came down in the Kensington street where Rolling Stone Ronnie Wood lives.